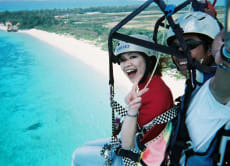 Hello, I offer paragliding flights for sightseeing in Okinawa. Since 1980, my team and I have helped many customers with experience beautiful sky of Okinawa. Admiring the beautiful coral reef of the sea from a height of 200m will definitely inspire you. This is a wonderful experience you cannot miss when coming to Okinawa. Paraglide the Beautiful Blue Skies of Okinawa! The staff was so friendly and nice. It was my first time to do paraglide and they taught me well. I had great time to view Okinawa's beautiful sky and sea. <3 thanks to Voyagin, I spent a great time. We simply loved that experience from A to Z, and recommend it warmly ! We both did it with my husband and fly at the same time with two of our host which was even greater. It was so perfect, we had a very good weather, and we actually postpone to one day later to have a clear blue sky thanks to the flexible staff. The only thing would be that it went too fast !!! But yeah, super soft take off and landing, good instructors and you have time to take pictures and videos on top of the sea. My husband is usually afraid of heights and he loved it too. Just do it if you go to Okinawa, don't miss this opportunity !!! It's a must see. Paragliding over Okinawa belongs to experiencing the island's beautiful nature. We also flew over the sea enjoying different colors and underwater creatures in the clear water. Our host was super professional, no hickups, and they were also very flexible when we asked to change the booked dates due to weather conditions.